For the Rover Centenary this year we interviewed Jearoid ‘Jazz’ Harris, an English teacher from Johannesburg, Gauteng. “Scouting is my hobby, or at least takes up almost all of my free time. If I could live on a permanent Scout camp, I would lead a very happy life”, he says with a smile. For the past two years Jearoid, or “Jazz” as he is known in the Scouting community, has served as the Chairman of the Gauteng Rover Advisory Council (GRAC) and has represented the region on the National Rover Advisory Council (NRAC). “In my own Crew I have served on the Crew Council at various times as Scribe, Vice-Chairman and Chairman”, he adds. “My first Scouting-like event was at a Brownie Pack meeting when I was two years old, as my mother was the local Brownie Pack Leader”, Jazz reminisces. “When I was six or seven years old I joined the Cubs and moved up to Scouts when I turned eleven. 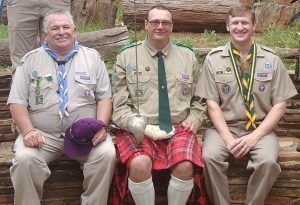 After my Matric I took an eleven year break from Scouting and re-joined in 2012 as an ATS in my Troop”, he says. One of his fellow ATS-es, who was a Rover, convinced him to join Rovers, as he had enough time to join before his 30th birthday. “I am passionate about Scouting in general because I can see the value it adds to people’s lives at all levels, from Cubs through to Rovers and also to the adult leaders”, Jazz says. “I think Rovers is very important and beneficial in helping young adults to discover themselves and set themselves up for adult life. There is a strong moral basis and ethical grounding established by the Promise and Law. Rovers provides a chance for personal growth through adventure, project management and service to others. Rovers is special, because one gets to do all the fun Scout things, but at a higher level and from an adult’s perspective”, he concludes. The motto of the Rovers is: Be of Service. Therefore his Crew was involved in a few projects. “The community vegetable garden at the Roosevelt Extension Nursery School was a pretty big project. The garden regularly provides food for children at the nursery school and is also open to the community”, he says. “The project involved digging up the garden, building the beds and finally planting the vegetables. Other projects include the service to the Scouting Movement with District competitions, galas and badge days. I am currently involved in a six-month project at the ARK Animal Center. We are socializing the young puppies, as well as training them and the older dogs. Part of the project is also to teach the school volunteers how to train the dogs,” Jazz explains. One of his most special experiences through Rovering was attending the 15th World Rover Moot in Iceland. Other highlights include hiking in the Drakensberg, paintball camps, Pop Bolton and planning and completing the community vegetable garden. “By completing the BP Award last year I completed a goal I had set myself: What I call the Grand Slam of Scouting. I achieved the Leaping Wolf, the highest award in Cubs, got my Springbok, the highest award in Scouts, and now my BP Award, the highest award in Rovers and Woodbadge”, he tells us. Jazz hopes that Rovers will be getting more and more involved in big public events like runs and walks, outdoor and lifestyle expo’s and the likes to increase being of service and at the same time to promote Rovering and help it grow. 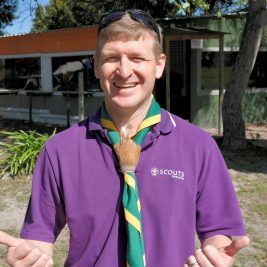 “Rovering has the ability to change mind sets, lives and communities in SA because Scouting is all inclusive, no matter one’s race, religion, political persuasion or sexuality. If enough young adults join Rovers, a culture of acceptance and togetherness will begin to permeate the rest of society. The moral and ethical grounding instilled by the Promise and Law can only be beneficial for members of the community, no matter what their social background is”, Jazz concludes.